We had another new Ford Focus RS in for a new car detailing package as the customer was looking for long term protection with a guarantee as well. The customer also asked the Ford Dealership not to wash the vehicle and to leave all the wrapping on, as all the preparation work would be done at Top Car Detailing. After removing all the wrapping on this vehicle, it showed that the paintwork was in pretty good condition and only needed a single stage machine polish. 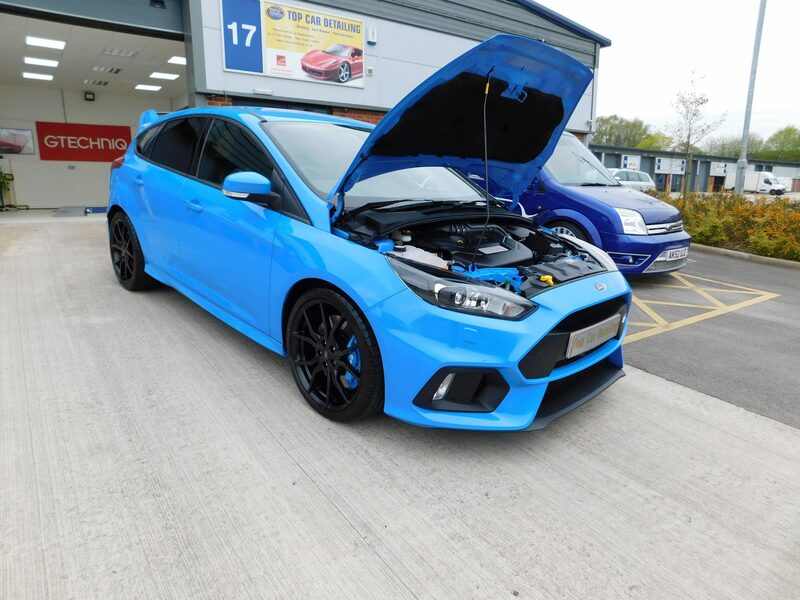 The Ford Focus RS benefited from the full Gtechniq new car detailing package, this included the full interior treatment as well. All the wheels were removed and treated inside and out with Gtechniq Wheel Armour. After machine polishing and getting the gloss level up to 100% we then applied the Gtechniq crystal serum and Exo V3 forming CS Black. This coating also comes with a 7-year manufacturer Guarantee when you have your car detailed at Top Car detailing. The engine bay and all exterior trim was treated as well giving long-term protection. Are you buying a new car or know someone who is then this might be the right coating for your car, give us a call and find out more?